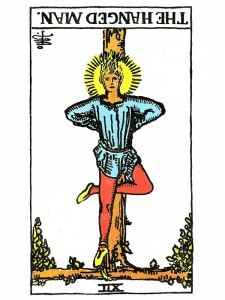 The Hanged Man (R) says you need to look at the beliefs that are causing you stress and hanging you up. To get rid of a limiting belief – create a new, opposing picture in your mind – affirm that the belief is not a reality, then generate the opposite emotion. This opposing picture will differ from the picture your physical senses are reporting to you and it is precisely in this area that change is required. Your inability to get free of social pressures is caused when you do what other people expect or demand of you, rather than listening to your “inner” Self. Your awareness of life becomes secondary and never a direct experience. When you fear change and fight your “inner” self by accepting your environment and circumstances – you become preoccupied with material matters and refuse to accept that there is more to life than the practical, rational world. Suspend your judgments, even your expectations if you hope to receive higher knowledge – be willing now to make your mind a clear, reflective vessel. Accept your reality – you can not deny who you are – your own “ego” has created these “false” securities. Surrendering to your reality opens the doorway to a new and “better” reality. Trust your abilities, build your plans and accept that outward appearances do not always present a true picture. Seek the “inner” light – the stability that will never change. Use your intuition and you will be able to perceive directly what is going on. You will understand that everything is working for you. You need nothing at all to complete who you are – you are always free to love and experience love, because you no longer need to cling to people or be jealous of them – you now realize that you are complete “with” or without them. How are you hung up? In the first position: An open heart must prevail. Such openness is not without its risks, but for you and this path, closure is much more dangerous. In the second position: There may be little contingency should your network fail. Ask what you alone could achieve if the need arose. In the third position: You may be bombarded with social opportunities as the walls of your box come crashing down. In the fourth position: At one extreme, you are the party animal who cannot sit still for a minute. There is very, little that you prefer to do alone. You may marry many times. At the other extreme, here is the true loner, perhaps shy and introverted, but not necessarily. But, the preference is for your own rather than another’s company. If you marry at all it will hopefully be to a very understanding and self – sufficient person. In the fifth position: With input from your heart, your gut reaction, you may be reversing your opinion on a subject. In the sixth position: A time out may be the order of the day soon. In the seventh position: You must override your fear of openness and contact with people. It is stopping you from reaching your mental goals. In the eighth position: At one extreme, there may be too much going one, confusing matters as most of it has nothing to do with you. At the other extreme, there is too much closure and not enough is going on. Decrease or increase contact until things even out. In the ninth position: A change of heart that needs more attention. Hesitation in an aspect of opening that is slowing your progress. Closing of the heart chakra. In the tenth position: At first, this process may feel like it is only benefiting others – be patient, this process benefits many others, but it is indeed for you.